Pay no attention to the mouse behind the curtain; just look at all the pretty lights. Seriously, that’s what he’s telling us to do, and on that, more power to him. Photo by Denise Truscello/WireImage (CC-BY-ND) The Cosmopolitan of Las Vegas. Deadmau5 might want to take off that mouse head and look around a bit more often. Not every artist in his position would admit as much, and that’s admirable. He goes on to explain why he makes that decision. The reality is this: it’s not in spite of the massive fees Deadmau5 commands that his performances are so conservative. It’s because of them. With tens of thousands of people ready to hear your tunes the way they sound on the album, you simply can’t afford screw-ups. So, Deadmau5 concerts are largely pre-baked sequences, running SMPTE clock to other devices and lighting, and a lot of visual effects and Deadmau5 pulling off creepy, light-up Jack Skellington-goes-to-a-rave-at-Disneyland chic. It’s a decent guess that some artist in particular set off this rant. (One reader suggestion: Ean Golden at DJ Tech Tools laments the lack of EDM rock stars, which seems to suggest reader Bas is correct when he says in comments this whole affair is a collision of DJ and band culture.) And when he complains that other big acts aren’t doing much on stage, either, when top-flight DJs are doing pretty predictable, pedestrian sets, I think it’s completely fair. The problem is, Deadmau5 goes further, extending the reality of his set out to the realities of everyone’s sets, everywhere. It’s as if the universe somehow exists inside that mouse helmet of his. Whatever the meaning of that pendulum swing, Deadmau5 seems to have appointed himself spokesperson for the resurgent “EDM scene,” investing faith both in the idea and his own unique ability to speak for everyone else in it. its no secret. when it comes to “live” performance of EDM… that’s about the most it seems you can do anyway. because this whole big “edm” is taking over fad, im not going to let it go thinking that people assume theres a guy on a laptop up there producing new original tracks on the fly. becausje none of the “top dj’s in the world” to my knowledge have. myself included. A lot of resentment of people in positions of success stems from jealousy. But here’s a reason to truly question Deadmau5, and I think fairly: whether consciously or not, he’s using his success as both a platform and a filter. Whereas some artists use mainstream popularity to champion unknown artists (think Radiohead with Sigur Ros, for instance), Deadmau5 defines the “EDM scene” purely based on success, and then makes pronouncements about everyone else. Many artists are doing “something special” outside of the studio. There are DJs doing more than just twiddling knobs, configuring elaborate loops that allow them to rework music as they play. There are people scrambling to patch modular synthesizers onstage. There are people who sing or add vocals or instruments, live, over their sets, while still maintaining enough underneath that people can dance. There are people who can play entire techno dance sets, live coding or live patching entire compositions improvisationally. There are artists on instruments like the monome, cutting up patterns as they go. There are controllerists and scratch turntablists, finger-drumming percussionists who toss all the loops and play beats from one-shots, multi-instrumentalists and beatjazz maniacs. And the list goes on. All of these people have two things in common. First, people dance to their music. Second, they don’t know what will happen at the beginning of the night. Whatever it is you do, not knowing yourself what will happen can be part of the pleasure of playing. These performance techniques are not always reliable, or even advisable. Part of the reason some of us seek out smaller venues, crowded clubs and experimental music haunts, is because we’re excited to see stuff break. There’s something thrilling about watching a set on the verge of a meltdown, about seeing someone try something that then really doesn’t work – all for the chance to see someone produce something really new. People wouldn’t gamble at horse tracks if they always won. Somewhere in the repeated agony of defeat, you hone the taste for real victory. Ironically, unpredictability, the exchange of energy between performer and crowd, is supposed to be part of the legacy of Electronic Dance Music or whatever you want to call it. In these bigger shows, with crowds craving predictability, “EDM” seems to have acquired some of the worst tendencies of “just like on the album” replication that has plagued other acts. But it doesn’t have to be this way. Laptops have still only been capable of playing onstage for a short while. It can still be “The Right Stuff” era of laptop music, in which daredevils risk unlikely and unwise feats of death-defying insanity. 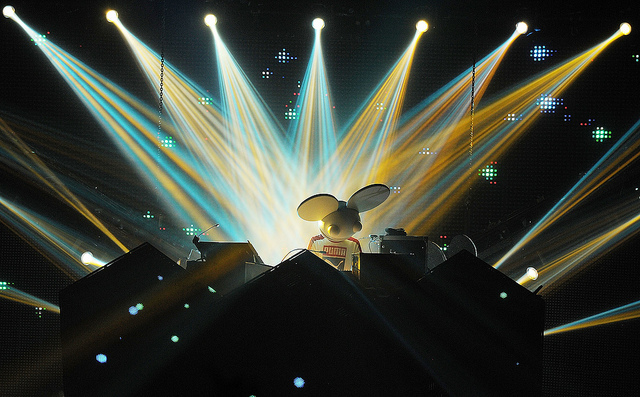 Deadmau5 may not see anyone doing “something special” with their laptops live onstage. But a lot of us go out to watch people live in the hopes that we will. Side note, illustrating that the world is bigger – you can now read about controllerism – erm, Kontroleryzm – in Polish, if you like!